The average American produces 102 tons of garbage across a lifetime and $50 billion in squandered riches are rolled to the curb each year. But our bins are just the starting point for a strange, impressive, mysterious, and costly journey that may also represent the greatest untapped opportunity of the century. In Garbology, Edward Humes investigates trash—what’s in it; how much we pay for it; how we manage to create so much of it; and how some families, communities, and even nations are finding a way back from waste to discover a new kind of prosperity. Along the way , he introduces a collection of garbage denizens unlike anyone you’ve ever met: the trash-tracking detectives of MIT, the bulldozer-driving sanitation workers building Los Angeles’ Garbage Mountain landfill, the artists residing in San Francisco’s dump, and the family whose annual trash output fills not a dumpster or a trash can, but a single mason jar. 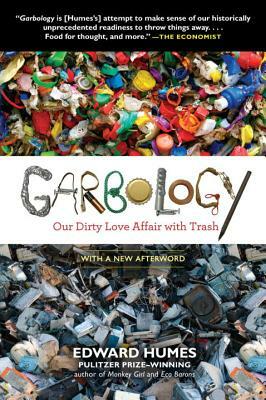 Garbology reveals not just what we throw away, but who we are and where our society is headed. Waste is the one environmental and economic harm that ordinary working Americans have the power to change—and prosper in the process. Garbology is raising awareness of trash consumption and is sparking community-wide action through One City One Book programs around the country. It is becoming an increasingly popular addition to high school and college syllabi and is being adopted by many colleges and universities for First Year Experience programs. Edward Humes is a Pulitzer Prize–winning journalist and author whose eleven previous books include Force of Nature, Eco Barons, and the PEN Award–winning No Matter How Loud I Shout. He lives in Seal Beach, California.